Leveraging on the expertise of our workforce, we bring forth a comprehensive array of Engineered Glass Systems. These systems are designed and manufactured using top notch facilities to keep apace with the counterparts. Further, we assure features like corrosion resistance and longer service life. Super manufactures different types of Mobile Phase Separator, both vertical and horizontal type, with PTFE adjustable overflow valve for phase separation. 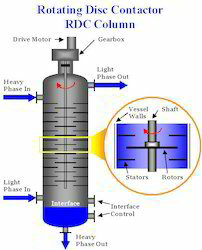 Vertical phase separators can be supplied with graduations. The separators are mounted on Stainless Steel tubular structure and provided with wheels for mobility. The separators are provided with drain valves for draining of the vessel totally and line valves for the two different phases. 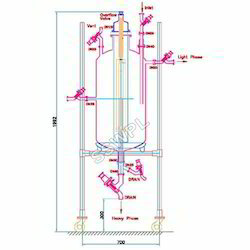 SUPER offers Mobile Reactor System in all glass construction; jacketed reactors with glass lined steel, and jacketed reactors in Stainless steel. In all the cases the overhead equipment such as condensers, reflux dividers, receivers and piping components are of borosilicate glass. The reactor and the associated glass components are installed on Stainless Steel tubular supporting structure. This structure is highly versatile and flexible. Any later additions can be effected without difficulty. Supporting frame work * Supporting frame work is of 25 NB Stainless steel pipes and connectors. We are manufacturer supplier and exporter of "Rotating disc Extractor". 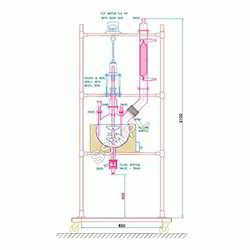 Extraction column is used in the fabrication of high-quality extraction products. Used in organic chemical separation, solvent recovery, purification of the product and also for other purposes. They have always been considered as great unit in the separation process as it is capable of doing such difficult separations which cannot be completed by any other means. They provide consistent plug flow condition and uniform distribution in sizes. 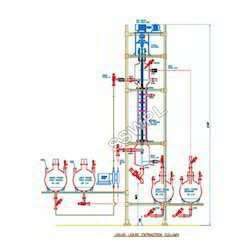 We also manufacture finest quality of Liquid Liquid Extraction Column to serve best features to our clients. With the deep knowledge of column hardware we ensure about the optimum solution for your troubles. Best Suited For Major Systems. Our manufactured products are made up of finest quality of raw materials due to which it ensures durability in the product nature. There are mainly three factors in our designed products which are the main keys of our success and these are quality designs, competitive price and timely delivery. SUPER manufactures wide range of Fixed Extractor like horizontal mixer settlers, multistage rotating disc extractor, and pulse column. The stationary extractor being offered consists of a Vertical rotating disc six stage extractor, two feed vessels, a dozing pump, and two receivers, one each for the light and the heavy fraction. Feed pump Dual head Dosing pump Glass / PTFE Capacity 400 l / hr – Quantity 1 No.